Subject: Weekly Cool Links #11 | 07.24.09 | 50% More Bacon Edition! So last night I went with a group to a new burger restaurant called Slaters 50/50 in Anaheim Hills, you can read all about it on my restaurant review site Eat in OC. Also I started another side project/website Bite Orange, still in the development process but Im pretty much online and running. Tonight Im going to a friends bachelor party, going to see The Hangover at Cinema Fusion in Anaheim, they serve beer and have leather recliner seats, then its off to the strip joint for a little relaxation, Kelly told me to have a lap dance, I cant let her down. Saturday I have the TinoJam softball event and Sunday a wedding, then Im on vacation for a week! Not much happened the past 2 weeks, which is why Im talking about the upcoming weekend instead, since Ill probably forget to talk about it in two weeks anyway. But now on to what everyone visits here for Erica Durance photos, er I mean my weekly (cough) cool links! Leading off its a video from The Daily Show about people that dont know when to stop after they have been proven wrong. Do you like online web games of adventure and quests and like music? Check out this one called The Sixty One, check out new music and complete quests, to be the ultimate music geek. Maybe games arent your style, how about 8-bit music renditions of Weezer songs? I cant wait to see the newest Star Wars movie! Wait what? Oh I mean the fan created 15 second clip Star Wars: Uncut edition. Fans will recreate the entire Star Wars movie 15 seconds at a time, till its complete, all 472 clips have already been selected and 25 clips are already completed. Or if you are a guy and looking to watch a chick flick you can check out this list of 20 Great Chick Flicks for Men (Including a movie with one of my favorite ladies, Anne Hathaway!) at the Orange County Register. Talking about movies, I'm looking forward to these both! If you are looking to cook food on the cheap, 5 Dollar Dinners should be able to help you stretch your paycheck when you have a family to feed. Even with ComicCon going on I dont have much TV news this week, other then Burn Notice is awesome and Eureka rules! 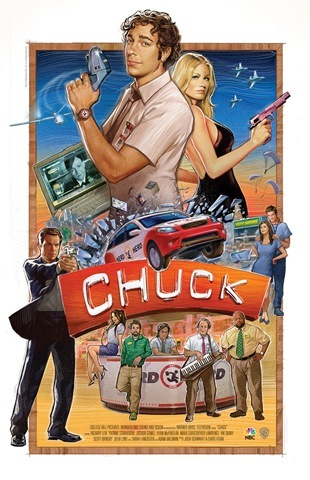 But I do have this totally cool poster to share for the upcoming season of Chuck! Lets hope Chuck is able to bounce back and get more then just the 13 episode order that its signed up for, its one of the best shows on TV. Buzz Aldrin thinks I'm cool, but not this guy. Im really impressed by these cool solar lights that Lifehacker hacked together from some cheap lights, I might just have to make some of those for the backyard. Or there is the $14 steadycam for you movie directors out there. Lastly I highly suggest checking out the most recent issue of Wired magazine for their article on The New Rules for Highly Evolved Humans, I particularly enjoyed this chart to determine what excuses to use when calling out sick. Long live Keyboard cat and the Three Wolf Moon! Originally published at Powered By Dan!. » Click here « to leave any comments.